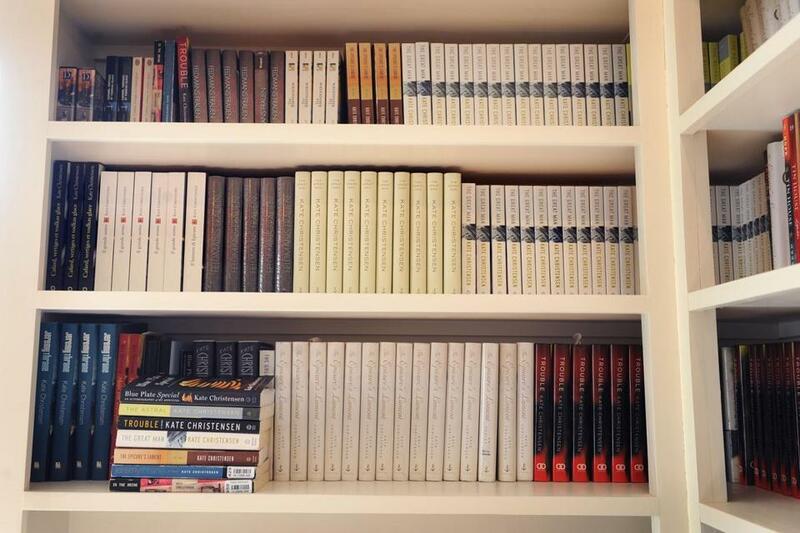 Kate Christensen keeps her books on a shelf that is visible for inspiration. On our Eastern Prom walk one day, we saw the amphibious tourist vehicle called the Downeast Duck trundle by us at the top of the Eastern Prom. A little while later, as we came along the trail above the bay, we saw it floating out in the water. “I want to make a dish called Downeast Duck,” said Brendan suddenly, after we’d been walking for a while in silence. I am always up for a speculative discussion of a hypothetical future meal. “What would you serve with it? What cuisine?” I said. “Chinese? With rice noodles? Ginger-cilantro broth? Hot and sour or barbecue sauce?” “Downeast,” he said. “So it would be Maine duck.” And that was that, because he is the native of this region, and therefore the authority on all things local. We batted this idea around, trying as hard as we could to include some lobster in our vision: duck confit with lobster terrine? Too fancy and labor-intensive. Roast duck wings with lobster claws? Funny in theory but awkward on the plate. Duck and lobster jambalaya, risotto, or paella? Too much starch all around. We jettisoned the lobster, or rather, saved it for another meal, and settled on the following simple feast: duck breasts, pan-fried until they render much of their fat, then a heap of cut-up potatoes, Yukon Golds probably, pan-roasted in the duckfat. The sliced crisp breasts go on top of a mound of julienned zucchini tenderly poached in chicken broth and butter. And alongside, a simple salad of sugar-snap peas in a dressing of champagne vinegar, hazelnut oil, and thyme. Later, on the way home, the Downeast Duck drove by us yet again. We waved at the tourists, and they waved back.